Global alliance of overseas Filipinos Migrante International chairperson Garry Martinez described Pres. BS Aquino’s fifth State of the Nation Address as “a litany of rhetoric, exaggeration and more lies”. “Facing isolation and the dissent of the people, BS Aquino attempted to deodorize the real state of the nation by providing the public with clichés and incomplete and selective data to further justify and defend the Disbursement Acceleration Program (DAP), sprinkled with theatrics and the usual bashing of critics. 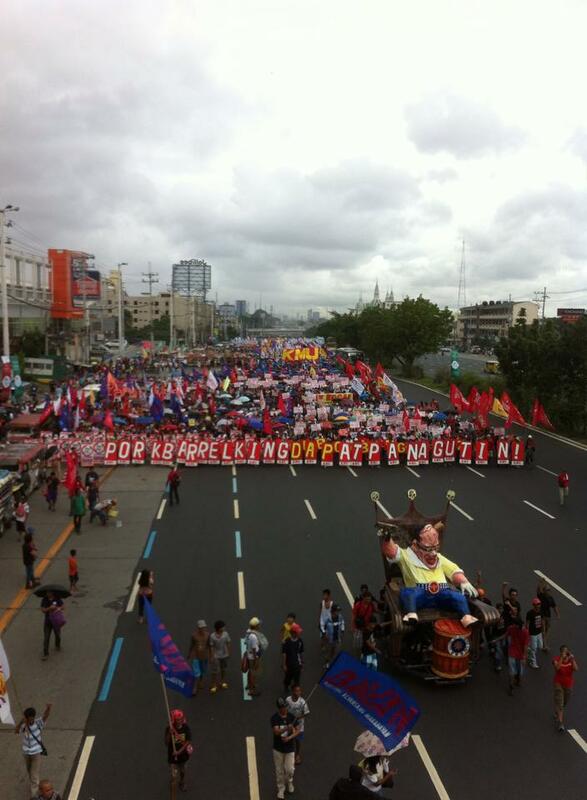 Yesterday’s biggest SONA protest under his term is proof that the Filipino people are not buying any of it,” Martinez said. BS Aquino has enforced a more aggressive labor export policy. By 2012, at least one-fourth of the country’s labor force has gone abroad to find work. There are now 15 million Filipinos abroad. According to the Philippine Overseas Employment Administration, 1.5 million Filipinos were deployed abroad in the start of BS Aquino’s term. Since 2010, the number of OFWs leaving the country increased from 2,500 daily to 4,884 in 2013. Last year, the BS Aquino government has breached the two million mark in deployment of OFWs for a year, the highest record in history since labor export was enforced in the 1970s. “Aside from thanking Filipino migrants for their relief efforts and donations to victims of Yolanda, no mention at all. For your information, Mr. Aquino, donations from our kababayans abroad poured in because they saw how inept and slow government response was and felt, rightly, that they had to step in to compensate for your criminal neglect,” he said. Martinez also called on Filipinos around the world to be vigilant against BS Aquino’s instructions to Congress for the “passage of a Joint Resolution that will bring clarity to the definitions and ideas still being debated upon” on the DAP. “This is a clear message to Congress, his allies, to help him legalize DAP. It is a message to the Supreme Court that he is out to defy and challenge their decision on the DAP. Let us all be vigilant and guard against any attempts of BS Aquino to evade accountability on the multi-billion peso DAP scam,” he said.